Not all social media conversations, particular those related to controversial health topics, are legitimate or authentic, according to a study by KDPaine & Partners that explores the nature of viral conversations around three controversial topics: high-fructose corn syrup (HFCS), foods containing genetically modified organisms (GMOs), and vaccinations. Of the analyzed 301,497 social media conversations on those topics over a one-year period, roughly one-third (33%) were generated not from real people but from illegitimate sources such as pay-per-click sites, content farms, and robot responders, the study found. 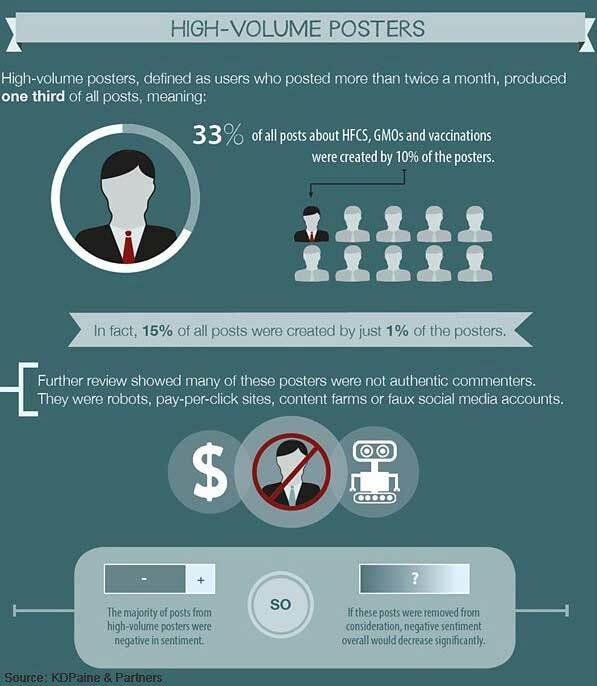 Moreover, those 33% of posts were generated by about 10% of all users/sources posting comments. On average, such "high-volume posters" generated 25 or more posts during the 12-month period.